With the realisation that the ageing baby boomers are one of the largest demographic group and are living longer and more active lives we are beginning to see a rash of designs tailored to this new and growing market. One such product is Dirk Biotto's called ChopChop is a kitchen that aims to make cooking a meal safer and more accessible. As aging baby boomers proliferate, the design community has become increasingly attuned to their needs. Take Dirk Biotto. 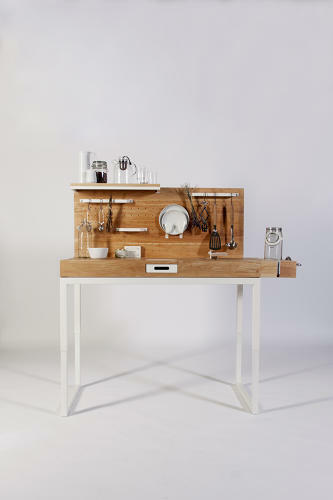 The Berlin-based industrial designer has created a kitchen prototype that aims to make cooking a meal easier, safer, and more accessible for the elderly. Called ChopChop, his design features a counter that is height adjustable and a backboard that hangs easily accessible kitchen utensils. An extendable hose allows pots to be filled from greater distances, so people don’t have to lug heavy pots of water across the kitchen. And if you want to fill a pot directly from the tap, a sloped sink makes it easy to slide heavy pots onto the working surface. The kitchen also takes inspiration from woodworking, and features a vise, which secures bottles and cans in place for easy opening.